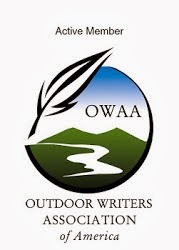 I went fishing last weekend so I've got some things to report, state, and ramble about. But I'm working on a short video project now and trying to earn a living and putting the finishing touches on some home improvement work so I haven't had time to post. Back to the regular schedule of rambling posts later this week. What I do have time for is a non-fishing rant. I'm used to going to websites and seeing advertisements tailored to the subject matter on the website. Go to a sports site see sports ads. Go to a fishing website, see fishing ads. It makes sense. And then I started to see ads that were geographic specific. For example, one for "Connecticut Driver's Insurance" but figured they just knew that the IP address for my server was in CT.... though now that I think of it I'm currently sitting in New York. So how to "they" know where I live. Now it's gotten a whole lot more big brotherish. I can't escape the Orvis ads. They're on many websites I visit that are wholly unconnected to fishing. 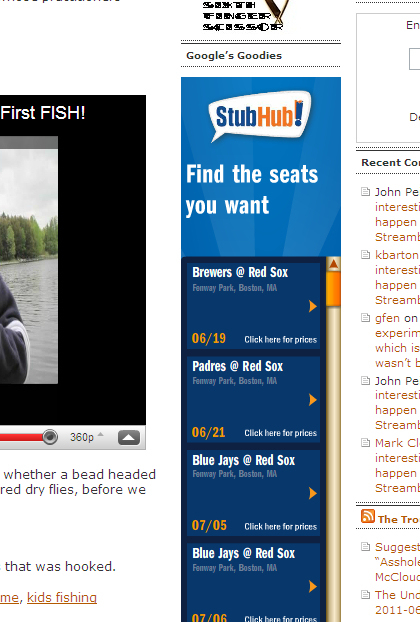 And this morning, I'm on a fishing site and I see an ad for Stubhub with tickets for upcoming Red Sox games. I was another site over the weekend buying tickets for a Red Sox game. So now "they" know that I'm a Red Sox fan and am interested in tickets. I'm not a bleeding heart liberal and don't think our privacy laws should be as restrictive as those in Europe but it does seem that "someone" is collecting a whole lot of information about me. I get that I've probably given "someone" a whole lot of info about myself via Facebook and other venues. But this advertising thing seems a bit more insidious. Who are they? What do they know? And will they use this info for anything other than hawking wares? Agreed! I've started getting annoyed and highly suspicious about this as well. And even in my email! If I email someone about, say, possibly taking a trip, all of a sudden airline/priceline etc. ads start popping up in my Gmail account. NOT coincidence. Makes me uneasy. AHA! You live there, yes. But have you ever visited? I think not! I didn't know there were fish in the desert. Wait, has one of the casinos put in a trout stream? It's called remarketing, and if unless you disable cookies, get used to it. Crap, there's a term for it. The next thing you'll tell me is that there's an acronym for it as well. We're screwed. BTW -- if you put something in a shopping cart and then abandon it, that object can easily follow you around the Internet for weeks... (that's called re-targeting). I'm glad no one can retarget the snarky comments I've written and then deleted in certain blogs. You have to take the bad as well as the good with the internet. You only have to worry when they star showing you adds about what you are actually eating or feeling at the moment or telling you that need a shave or your hair looks different today. Then it's time to shut it down.